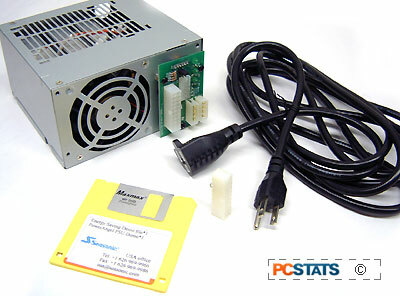 Abstract: This nifty device provides everything you need to precisely measure the power draw of your PC and monitor, and even power efficiency of your PC's power supply. In North America we're fortunate to have a good steady supply of energy available. Electricity is so easy to access, and relatively cheap that as a society we have become very wasteful with it. So, here's a quick question for you: when was the last time you considered how much power a device uses when making a decision on purchasing electronics? If you have recently bought a washer/dryer you might have taken notice; same goes for the refrigerator, but how about your computer or monitor? It is not uncommon for most people to leave their home and even work PCs on 24/7. A computer running day and night can handle fun tasks like P2P file sharing, distributed computing or code compiling, but people should start to take notice of just how much power their computers use. Now what if you knew that leaving a PC on all night cost X amount of money, would that change things? To answer such a question we need a test kit to find out how much power is actually being drawn to keep your PC running.... Enter the Seasonic Power Angel Tester. This nifty device provides everything you need to precisely measure the power draw of your PC and monitor, and even power efficiency of your PC's power supply. 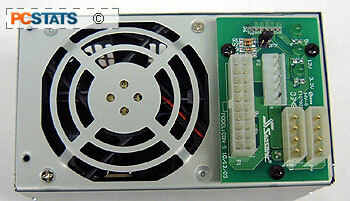 Seasonic put together a special kit for media which also includes a 120W dummy power supply load tester. The 120W has one 20 pin ATX input power connector and two male molex connections to simulate a PC complete with drives. There's also a power extension cord, a jury-rigged ATX 20 pin connector which can be used to turn an ATX power supply on without a PC (for testing purposes), and instructions and software for getting the correct figures out the tests. The array of items in this special Seasonic Test kit is a bit overwhelming at first, but when used properly it's a great tool and it has supplemented our power supply reviews quite nicely. 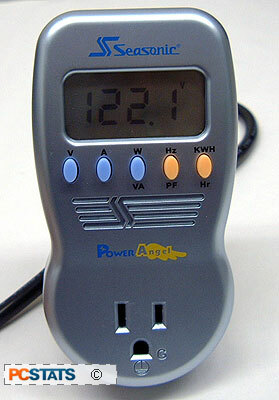 Unfortunately for anyone interested in conducting their own comparisons at home of powersupplies, this media test kit is not available to consumers, though the PowerAngel meter is. The meter is fine for testing the power draw of your entire PC at home.